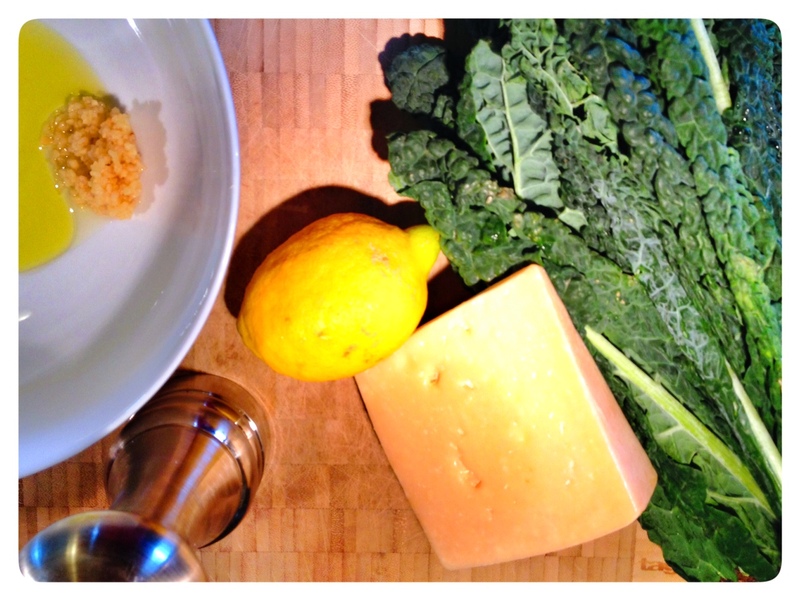 Tuscan Lacinato Kale Salad | This RD Eats! Last night was a proud moment for this dietitian-mamma. My 2.5 year old devoured kale. Yes, you read that correctly. My youngest had three helpings of a fresh kale salad that I made. I could hardly keep from jumping up and down. (It is the small victories that matter!) I knew that the Tuscan Lacinato Kale Salad that I made earlier that day was delicious (I should know, I helped myself to a rather large bowlful as a “tasting”), but I wasn’t sure if my children would like it. Kale, afterall is a fairly strong-tasting vegetable. Judging by the leftovers (about 1/2 cup total), I would say this recipe is a “keeper”. 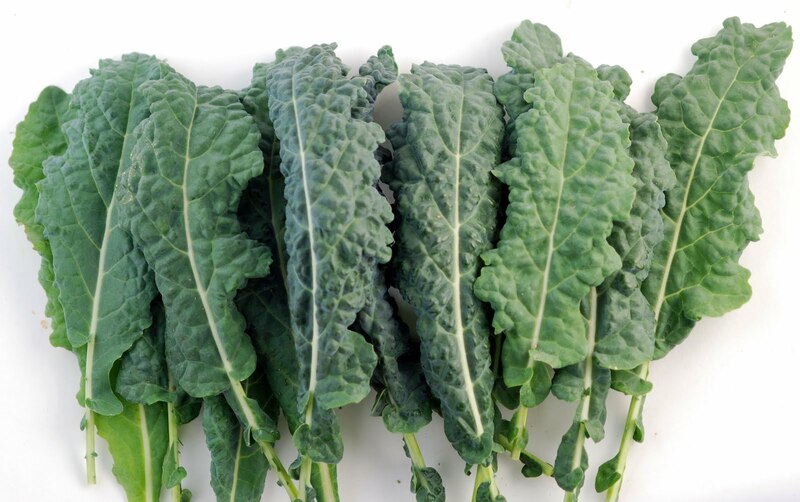 Lacinato Kale (also known as Tuscan Kale or Dinosaur Kale) is a very dark green, bumpy-textured kale. I knew I had to buy it the first time I saw it in our store. I didn’t have a plan for it, but thought I would make it into a salad like I have with other greens. (Like in the Lemon Parmesan Broccoli and Roasted Lemon Parmesan Brussels Sprouts. The recipe is simple and uses ingredients that I always have on hand (and frequently use together). Olive oil, lemon juice, Parmesan cheese, garlic, salt and pepper. So simple, but absolutely delicious. I mean, look at this amazing salad! 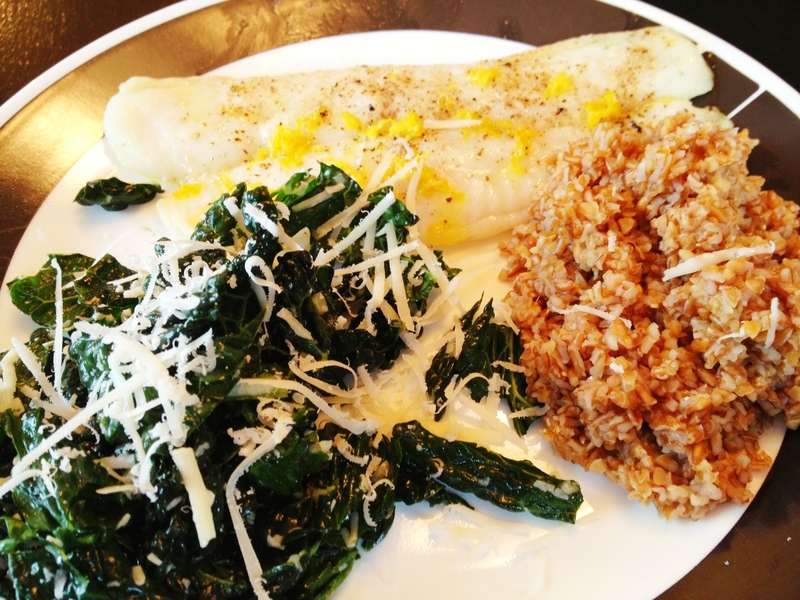 I served the salad with Lemon Pepper Fish and bulgur. A homerun for supper tonight. Evening meals can be a bit of a challenge (even for a dietitian), but my kiddos (and husband) loved everything. 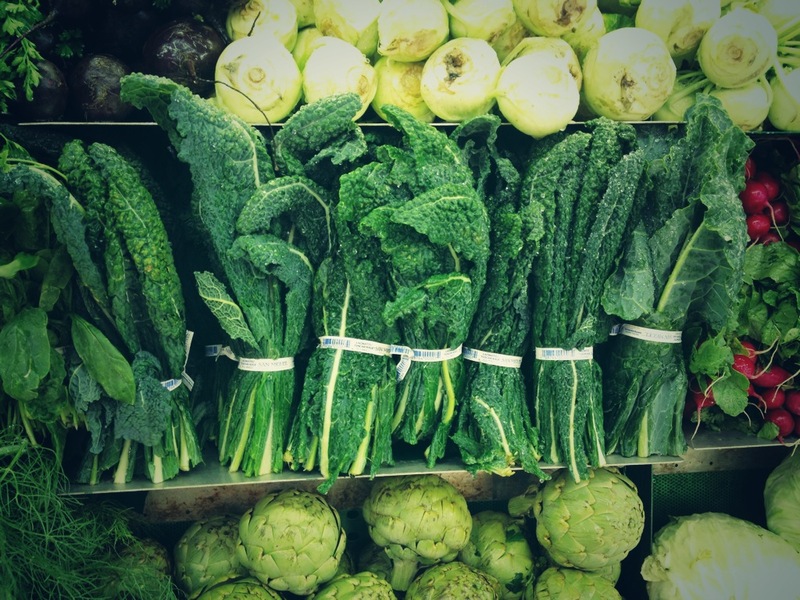 If you can’t find Lacinato kale, you can use the typical Curly kale or a mixture of both. If you like spicy, feel free to spinkle in a little dried red pepper flakes. Like any of my recipes, it is crucial to use quality ingredients. Always use fresh lemon juice and the grated parmesan cheese. It makes all the difference. 1. Wash and thorougly dry kale. Remove the stems from the leaves and cut into bite-sized pieces. 2. Place the kale in a large bowl. Drizzle the olive oil over the kale and add the garlic. Massage the oil into the kale. Don’t be shy, get in there and give your kale a good rub-down. 3. Add lemon juice, salt and pepper. Massage into the kale again. 4. Stir in 1/2 cup of the Parmesan cheese and add red pepper flakes (if desired). 5. Garnish with the remaining Parmesan cheese. *It is best to let this salad sit for at least 1 hour (even overnight is fine). 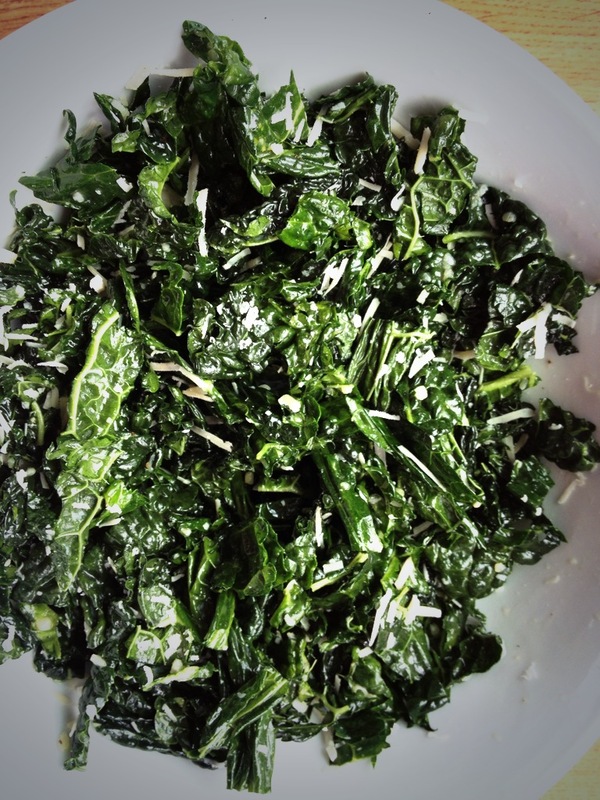 This entry was posted in Recipes and tagged Dinosaur Kale, kale, Kale Salad, Lacinato Kale, Lacinato Kale Salad, Lemon, Lemon Kale Salad, Parmesan, Tuscan Kale. Bookmark the permalink. Pingback: Spiced Lentil Salad: A Salad I Can’t Stop Eating! | This RD Eats! Pingback: Grilled Romaine Salad | This RD Eats!